Indoor athletics has been around for some time with the first British indoor championships being held at Wembley Arena in London in 1935. However, it was not until the 1960s that indoor athletics gained momentum when RAF Cosford, just north of Wolverhampton, became a popular venue in the 1960s. In Scotland, the first indoor championships were held on a 154-metre track at the Bell's Sports Centre in Perth in 1972, where they were held until 1976. Indoor athletics in Scotland fell into abeyance until the 1980s when, after a 10-year absence, a portable track was erected at Ingliston Exhibition Centre and Scottish championships were held there in 1987. Later in 1987, an international standard 200 metres track was opened at the Kelvin Hall in Glasgow, with the first meeting being held there - an open graded meeting - on 2 December 1987. 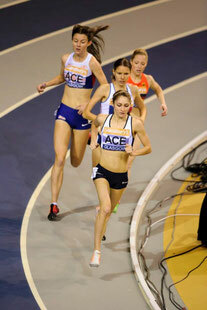 The arena changed indoor athletics in Scotland, attracting the first British international match (v France) on 6 February 1988 and staging the European Indoor Championships in 1990. 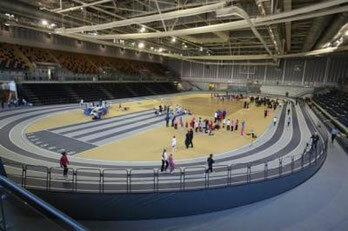 The Kelvin Hall's life as an athletics venue came to an end in 2012 when it was replaced by the Emirates Arena in the Dalmarnock area of Glasgow, a 5000-seater capacity arena with a hydraulically-lifted 200 metres running track (pictured above). 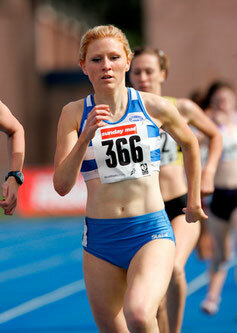 Scottish Indoor records are recognised at established events for all age-groups from under-13 upwards. 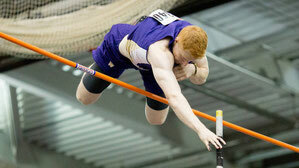 For seniors, national, native and all-comers' records are recognised. You can see all the current records here . We have also added historical records on to the record pages so that every athlete who has set a Scottish record can be recognised. Scottish indoor championships were first held at Perth in 1972. We have recorded all the medallists from all the senior championships held since that date. 6 - Melanie Neef, Jayne Nisbet. We have also recorded the champions from all the age-group championships. You can find all the information here. For more recent championships, you can find links to the full results here. The confined spaces of an indoor arena would seem ideally suited to the traditional international matches between countries. However, after a flurry of internationals in the early years of the Kelvin Hall arena, these international matches have been few and far between. Kelvin Hall and the Emirates Arena have been host to the British international since 1988 with the 1 v 1 match being replaced in 2000 by a 5-Nation event. Scotland has competed in this event in 2014 and 2015. Scotland's first indoor international though dates back to 1969 at Cosford. There was then a gap of 20 years to the next full international and there were a number of home and away international matches between 1989 and 1993. Thereafter, there was a one-off match at Cardiff in 2000 and a series of Celtic Cup matches between 2006 and 2012. 6 - John Carr, Ruth Girvin, Carol-Ann Gray, Gillian McArthur/McIntyre, Alan Scobie. (Note that we have defined an international as a match in which another nation competes. Thus inter-area matches are included where either Wales or Northern Ireland were among the opponents). On the world stage, Scotland hosted the European Indoor Championships in 1990. The best Scottish performances set indoors are included in our all-time ranking lists. These cover senior and junior athletes and can be located here.